A fascinating online science programme for the curious, including homeschoolers by Rohit Gupta, who blogs at Compasswallah, and tweets as @fadesingh, is an autodidact interested in the history of science and mathematics. In particular, interdisciplinary interactions such as between astronomy and geometry; or colonial science and its Oriental reception. Some of the previous workshops arelisted here, along with a recent interview. His older projects have been featured at Wired and the BBC. The sailors of yore braved storms, tsunamis and monsters to make their way across continents. Future spacefarers will pit themselves against interstellar dust, comets, asteroids, the perturbations of planets, gravitational tides and cosmic rays. As space travel becomes a reality, and mankind enters a new Age of Discovery, we will need new maps for this uncharted territory. Far from the comforts of our home planet a familiar drama will play out all over again. What other ancient knowledge and antiquated systems will we need to revive? The Age of Re:discovery is an online workshop that invites artists, students, scholars and thinkers from all over the world to explore this possibility together. 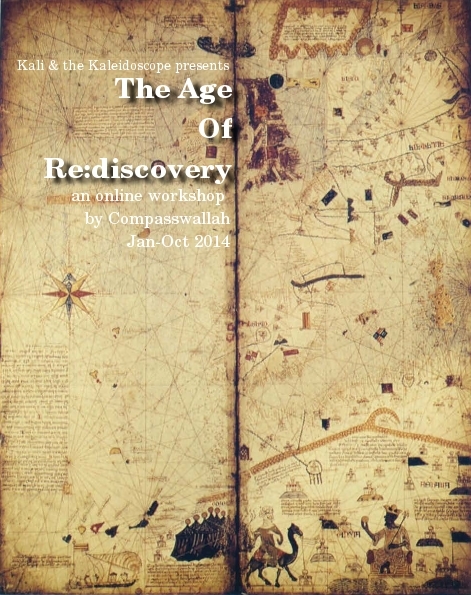 The duration of the workshop is roughly 9 months, extending from 29 January – 19 October, 2014. The expected commitment is roughly 2-5 hours per week, depending on your enthusiasm. Syllabus: We plan to take history of navigation techniques as the backbone of the story; then show how it connects to geology, biology, botany, astronomy, mechanics, physics, chemistry, commerce and medicine – across millenia. We can then speculate how all this oceanic history might play out on a different scale in outer space. One of the more interesting modules towards the end will be ‘gravitational cartography’. Ancient portolan maps failed to account for the curvature of earth. Will tourist guides of the solar system have to account for the curvature of spacetime? With a good enough map, one should be able to slide down a Japanese origami paper boat from Earth to Venus. [Some of this weird ‘experimental history’ might branch out as smaller projects in ‘design fiction’.] For more information and to register, please see the programme announcement. This entry was posted in Examinations and courses on January 15, 2014 by vidyut. Thought Max and I (Gillian) would just update you on the Math exam that Jeremy (our son aged 15 yrs) sat for on October 29, 2013. Mathew, you are aware of a few details but thought I would record the entire happening for the information and awareness of all parents whose children may sit for the NIOS examinations, henceforth. Our son Jeremy sat for his 10th Math paper on Oct 29 2013 after much preparation because the portion is quite vast and not very easy. The paper was from 2 to 5 pm. He began well and after completing about 60 % of his paper, he asked the Supervisor for an extra answer supplement. The first supplement had apparently 28 pages. The Supervisor, however, refused to give him an extra supplement to complete his paper. Shocked and taken aback Jeremy asked if he could use the extra paper he had in his bag. Obviously, the request was turned down. So Jeremy came away with an incomplete paper having finished only around 65% of his paper. This was really upsetting for us since Math was to be his main subject when he enrolled in college. The next day, I tried to get through to some official in the NIOS Regional Office to no avail. While browsing through the net, I spotted a web page which said CONTROL ROOM. So I called again to no avail. It is generally difficult to get through to any NIOS office on telephone. However, this time about an hour later, we received a call from one of the numbers I tried calling and it happened to be a director of NIOS. He asked us to write a letter to the office stating whatever happened. Which we did. A week or two later we received a reply from them stating that what the Supervisor did was in line with a clause in chapter 7 of the Guidelines for Centre Superintendents. Being people who believe in Jesus and the power of prayer, we prayed and asked God to show us what step we should take for the good of our son and for as many children who will benefit from this experience, Max and I felt we should take this forward and challenge this clause as it is illogical and unfair to students. We were lead to take legal action through a group of young lawyers who willingly took up our case. We are hoping for either of these two outcomes: 1) The clause would be more apparent and observable on all literature being sent to students sitting for the NIOS exam in order to prepare them adequately to complete their paper in the supplement provided and 2) this clause could be scrapped all together. Though this will not benefit Jeremy much, since there is an option of a re-exam, we are hoping and trusting that God will do what is best for all. A writ petition will be filed this week in the form of a PIL (Public Interest Litigation). We seek your support for the same and trust that in Christ we have the victory! We would also like to know if any of your kids have had a similar experience with the NIOS examinations, since this will strengthen our case and would benefit all. Priya Desikan, one of the members of our homeschooling group connected with Mr. Anil Nair, Coordinator- NIOS, Trivandrum (voluntary post). The shocking experience elaborated here needs a soothing answer. Eeventhough I am not a paid official of NIOS, I am coordinating some activities of NIOS at local level. I share the agony of the parent as I myself a parent of an NIOSian. First of all this being a Open Learner, you must keep in regular touch with your co-ordinator (normally Head of the School). People often do Online Registration and just go for the examination. Fixing the rules and Regulation is essential for World’s largest examination. It should be tamper proof and trustworthy. Before playing any game, knowing the rules is the player’s duty and not only of Referee’s. The parent should have spent a little more time on this as 48 pages is fixed not for the particular student but for the learners world over for three hours. Simultaneously legal action may be initiated but that wont give any relief to the learner. I am very happy to reply to number of mails received on matters relate to NIOS. Kindly address such queries on anil_vs_usa@yahoo.com. How to achieve this has not been mentioned, but the agreement that there is a problem that needs to be fixed is important. In the meanwhile, the parents of the child are filing a Public Interest Litigation to demand better transparency in the process and are open to other parents adding their voice to the process. If you are interested, get in touch with me and I will connect you to them. a.) That the rule of examination provided under Chapter No 7.7.1.5 of the Guideline for Centre Superintendents is arbitrary and prevents students in a Theory Examination from having sufficient writing space to produce their answers. b.) In any case the rule concerning additional answer sheets must be well publicized to the Students and Parents both orally and with a written intimation in a conspicuous place such as the Hall Ticket or on the first/original answer sheet. c.) That before the said rule in Chapter 7.7.1.5 of the Guidelines for Centre Superintendents is enforced, the very same rules mandate that the invigilator is to announce the said rule before the commencement of every examination paper. The invigilator failed to make any such announcement in the case of the examinations taken by the Petitioners son. This entry was posted in Examinations and courses on December 14, 2013 by vidyut. ALERT: Parents of children appearing in NIOS boards – No extra answer sheets! A rather horrifying experience has come to my notice. A child appearing for the Maths exam through the NIOS was doing fine, till about 60% of the questions completed, he asked the supervisor for an answersheet supplement as he had run out of pages on the provided answer booklet. What follows is a horror and something parents MUST know and prepare their children for, till fixed. The supervisor refused to provide him an answer sheet supplement stating that it is not allowed. Worried, the child asked for permission to continue answering on his own papers he had in his bag. Naturally, that was refused. He had to leave his paper incomplete in spite of being well in time, because he ran out of writing space. There will be no continuation answer sheets. The candidates will have to complete their answer in the first Answer Book itself. I have no idea what education system is up to these days, but when I was the age to give exams, there was a certain sadistic pleasure teachers took in getting us to write nice lengthy answers and use lots of supplements as some benchmark of brains, so this came as a total shock. Regardless of the reasoning behind such an absurd clause, if it was to be enforced, then it should have been mentioned in a far more upfront manner – like in big letters on the answer book – “Use the space carefully, supplementary sheets will not be allowed” or something. Also subjects that may take up more space – involving equations, reactions, diagrams, drawings and such should have default booklets with abundant paper! It is rather unbelievable that a student is able to write only 60% of the examination paper for lack of space. Obviously this is a problem that needs to be fixed, but while it is still a problem, do spread the word among anyone appearing for NIOS exams among people you know, that the answer booklets are all the paper that will be allowed to answer on, and to use it carefully. Note: I have no idea if this is the case with other boards, but it is worth confirming rather than a student getting a shock like this. This entry was posted in Examinations and courses and tagged Answer Book, Education, Mathematics, National Institute of Open Schooling on December 12, 2013 by vidyut.